I know that quite a few of you are, like me, owners of the Rigol DSA815-TG. 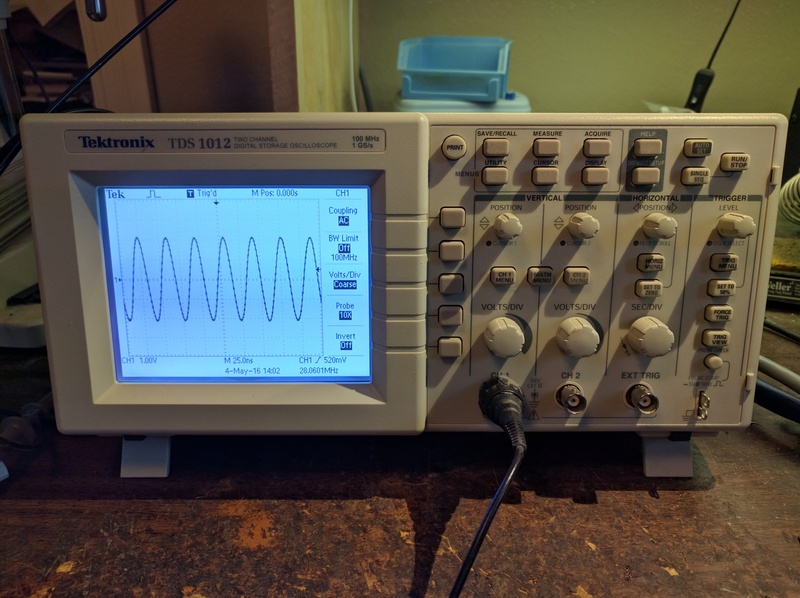 It’s been a reliable workhorse in my lab since I’ve acquired it, but the one thing I believe that I’ve wanted to most from it is a an RBW minimum of 10 Hz instead of the specified 100 Hz. That would allow for better characterization of narrow filters like crystal ladder filters and would let you better see fine details about signal. 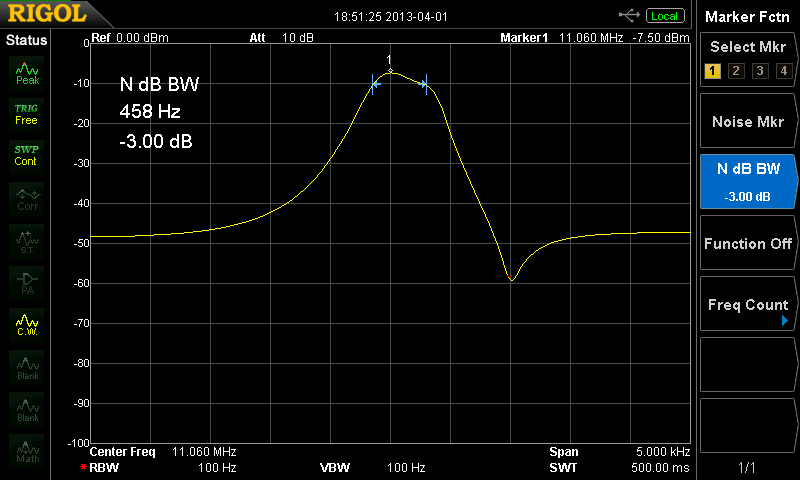 Existing DSA815 owners at 1.09 FW or above can upgrade to the latest 1.18 FW version to activate the 10 Hz capability. I believe that the link provided at the end of the email was a custom tracking URL for me, so I’ll direct you to the Rigol NA DSA800 product page, which has a link for acquiring the latest firmware. Make sure that you are getting the 1.18 version of the firmware. 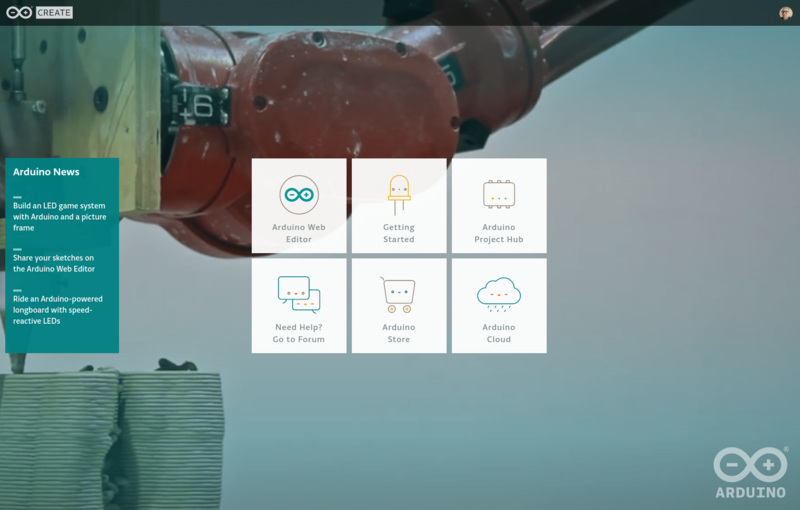 The installation is a snap and the RBW improvement is an exciting new feature to get for free. Thanks Rigol! 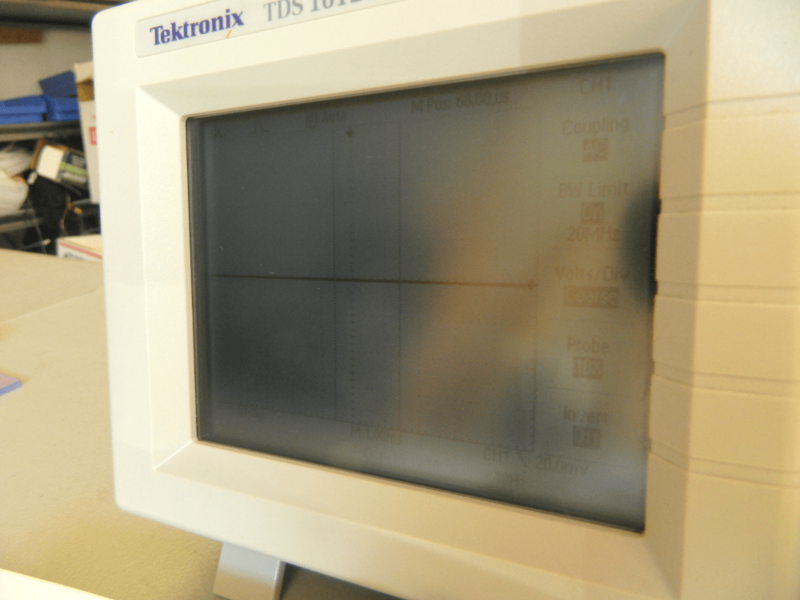 Back when I was working at Tektronix (wow, this summer it’s been 10 years since I graduated with a AAS in EET and started at Tek), they had a one-time program where an employee could purchase a new TDS1000/2000 series oscilloscope for half of the list price. This was back in the day before the era of cheap and decent Chinese-manufactured scopes, so naturally I jumped on the deal. Even though I wanted more, I found that I could fit the TDS1012 into my budget (list price was a bit more than $1000 at that time). The TDS1012 was a very faithful instrument on my bench for many years. I came to depend on it quite heavily. Too heavily, in fact, as I left it on a lot. Not thinking about the ramifications of it at the time. A few years ago, the backlight in the scope started fading, and not long after that, gave out completely. 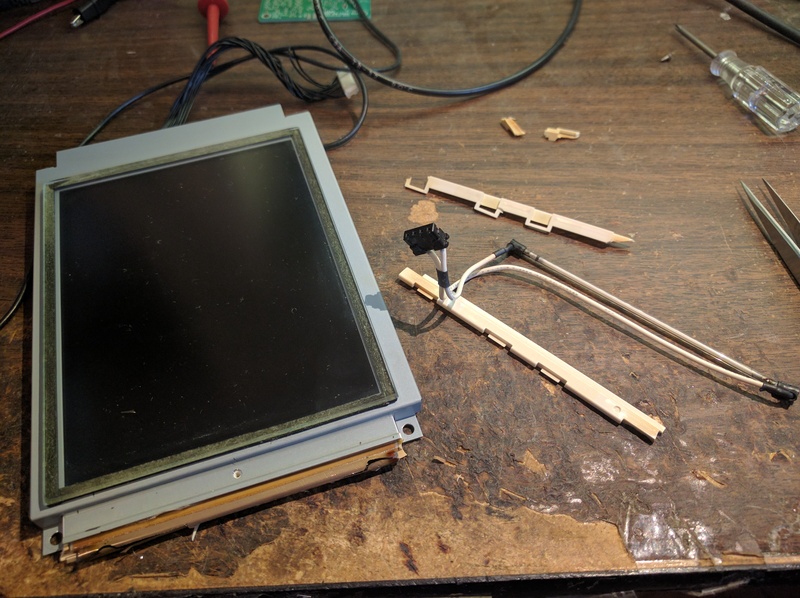 I figured I could just replace the display module, but finding a replacement turned out to be more difficult than I anticipated. Tektronix repair didn’t stock it by the time that I inquired about it, and I could not find any through the back-channels that I checked with my Tektronix contacts. Even looking for NOS on eBay was fruitless (although later on, some grey market displays started turning up there for expensive list prices). Eventually I gave up hope of realistically finding a replacement display and tried to sell the scope, although not very enthusiastically. The scope stayed in this state for quite a while, until I found something fortuitous. 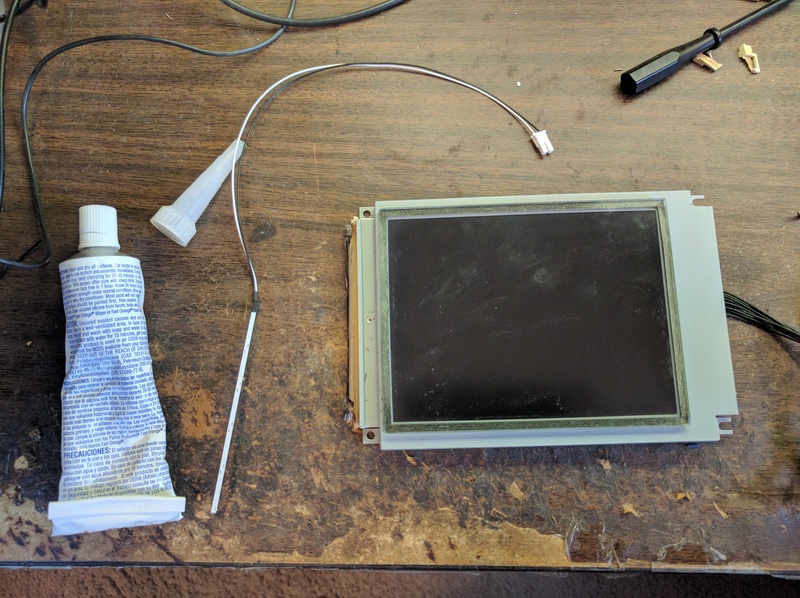 One of my favorite vlogs is The Signal Path, and Shahriar recently released a short video about repairing an VNA with a broken CCFL backlight with a LED replacement. I’m not sure why it never occurred to me to try this, but I was grateful to have seen a path forward with the TDS1012. I didn’t even know that there existed LED backlight upgrade kits, but I shouldn’t have been surprised. Long story short, I ordered a handful of parts from eBay and took a chance, and was rewarded with a working display that was able to bring my beloved TDS1012 back from the dead! I’ll give you some details below so that hopefully this can be of help to others in the future. The first thing to do was disassemble the TDS1012 so that I could get to the guts. Fortunately, I had done this in the past, so I knew exactly what to do. It’s actually quite easy to do in the home lab with just two tools: a deep Torx T15 screwdriver and a small pair of hook-nosed tweezers. 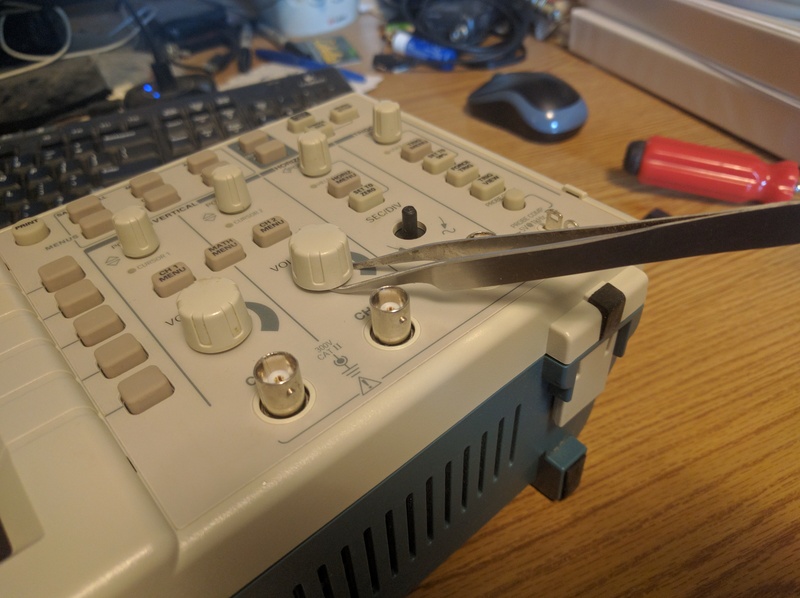 Pry off the knobs on the front panel by wedging the hook-nosed tweezers in the gap between the knob and panel, and then using them as a lever. Remove the back case from the instrument by unscrewing four T15 screws: one on the bottom-left, one on the bottom-right near the AC power connector, and two hidden under the fold-up handle. 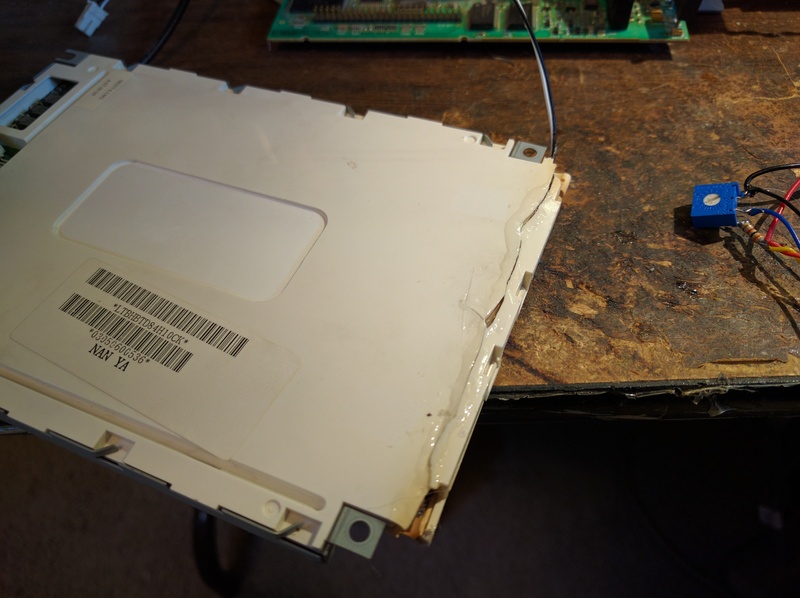 Next, the front panel can be removed by unscrewing five T15 screws: one on each corner and one hard-to-find screw that is between the CH1 and CH2 BNC connectors (on the back of the chassis). You can see side where those screws need to be removed from the chassis in the photo above. Once the front panel is off, you can now remove the display module. 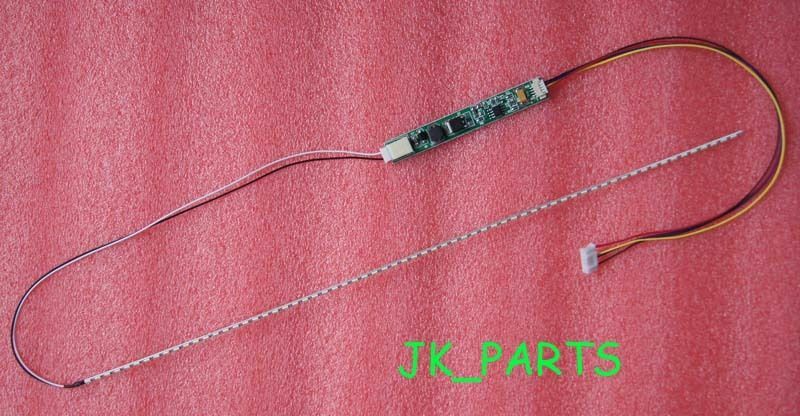 There are two cables to disconnect: the CCFL backlight cable going to the HV supply, which is on the top-left of the above photo, and the data cable which is on the right side (unseen in the above photo). 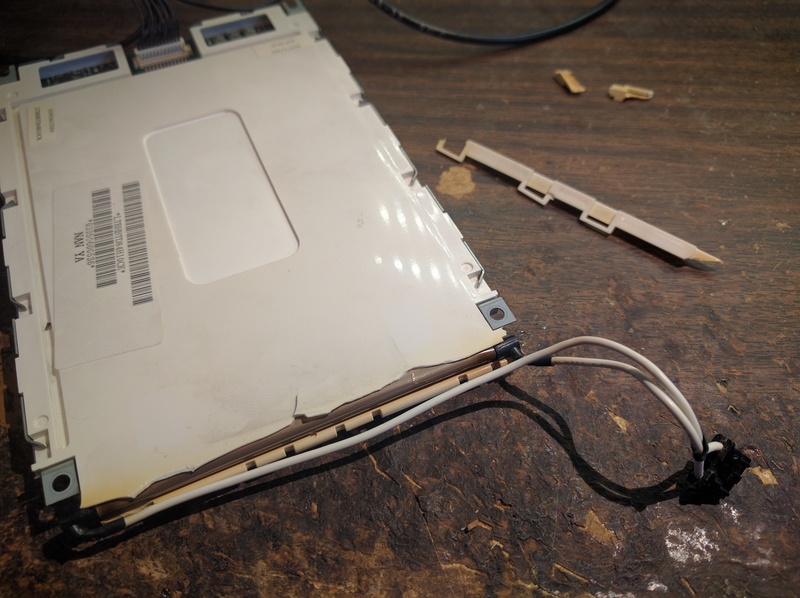 Disconnect the CCFL cable and the data cable from the main board, and then remove the four T15 screws from the four corners. Now with the display module removed, you can see where the CCFL lives on the left side, under the beige plastic. I removed the Kapton tape securing the CCFL leads to the module, and then tried to pry the plastic apart at what looked to be interlocking snap tabs. That turned out to be a bit of a mistake. The plastic was quite brittle and broke on the back side, including a few fragments from each end that snapped off completely. I think I should have removed that tiny screw that you can see on the center-left of the front of the display module before trying to take the CCFL out. There is some metallic foil that loops around the CCFL. I used a craft knife to slit it down the length of the display, freeing the CCFL from the module. You can see the burned-out CCFL in the photo above, removed from the display module. Now that the defective part was removed, it was time to figure out how to rig up the new LED backlight. Here you can see the LED module as packed by the seller. I was pleasantly surprised. Quite nice and secure. And here is the LED kit. This kit was made for a 15 inch monitor, so I would only need part of the LED strip. As was the case with other LED strips I’ve used, this module was wired so that groups of three LEDs were in series, with each of those groups in parallel with each other. I cut the LED strip at a multiple of three at a size that would fit where the CCFL used to live. Be very careful with this strip, as it is quite fragile and could easily break at the length it is shipped (which I’m sure it why the seller packaged it so well). Next, I lashed up the LED driver module on the breadboard to see how it should be wired. 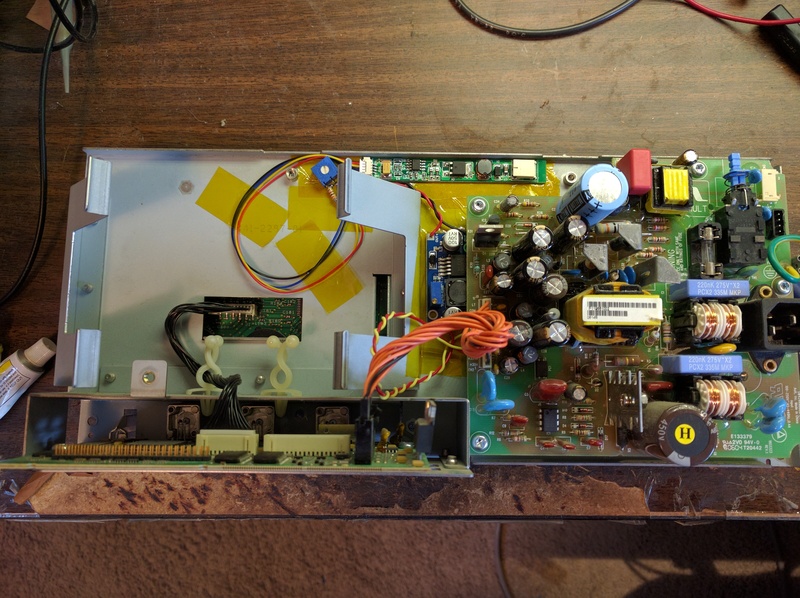 As is common with these eBay modules, the documentation is pretty lacking, so I had to put in a bit of work to make sure I got the wiring right. There are four input pins on this module: VCC, GND, ENB (enable), and DM (dim). 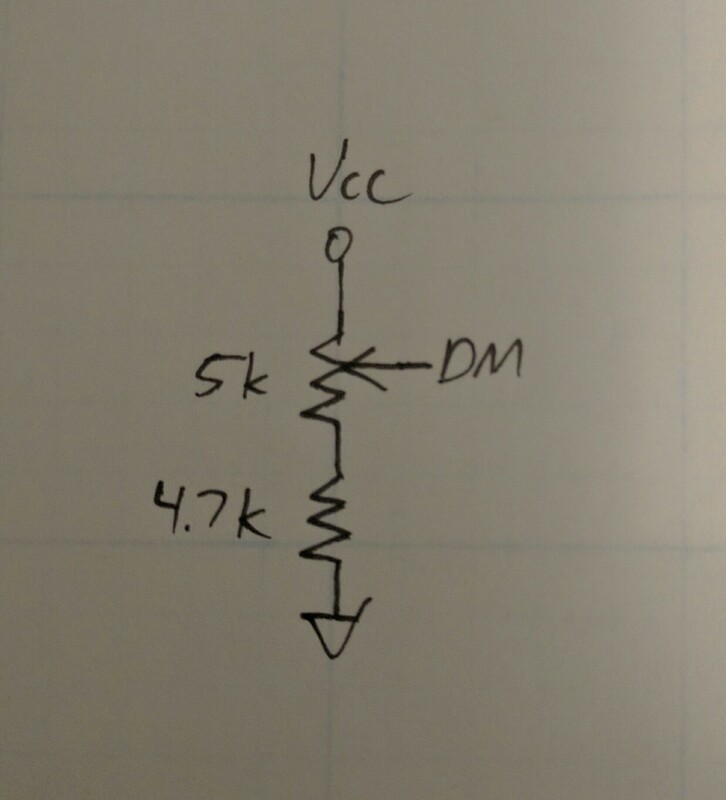 A bit of experimentation showed me that you needed to tie ENB to VCC and that DM could be fed using a simple voltage divider with a trimmer and fixed resistor to provide an adjustable voltage to DM that ranged from about 0.5 VCC to VCC. The product page recommends that the DC input be at least 10 VDC, and when driving it with >11 VDC the LEDs were quite bright. Any voltage below about 9 VDC, and the LED just won’t light. In a lot of instruments, that may not be a big deal, but it was a problem with the TDS1012. It turns out there is no 12 VDC available, nor anything even close. The only other appropriate DC voltages available from the power supply are 6 VDC and 3.3 VDC. But the module just won’t run on a voltage that low. I identified the IC on the LED driver module to be a DF6113. By the looks of the datasheet, it should be able to function as both a boost converter and constant current source for the LEDs, but this particular module will not run at 6 VDC. 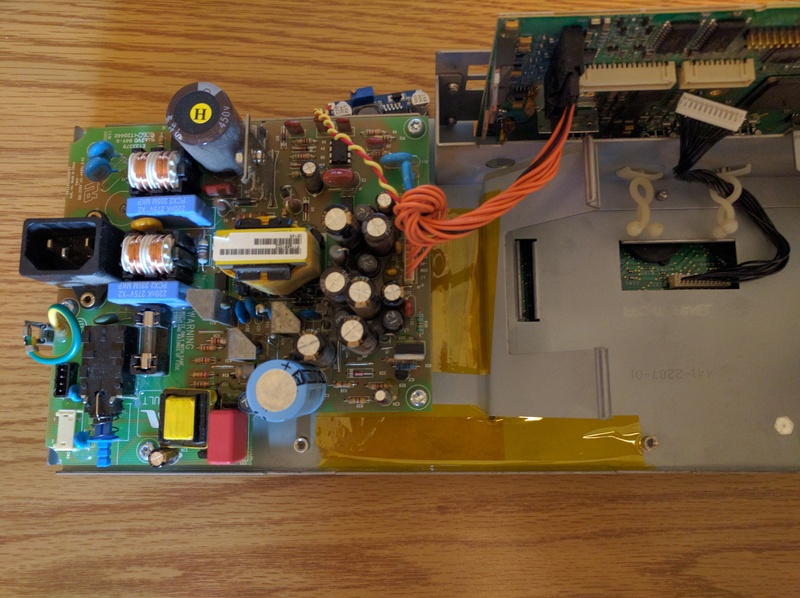 A bit of half-hearted reverse-engineering showed me that while the DF6113 has the capability to function as a boost converter, that functionality was not being used here. In the reference design on the datasheet, it shows it being used as a boost converter with an LED output which is ground-referenced. However from what I could suss out of the eBay module, this one was configured to not be ground-referenced. 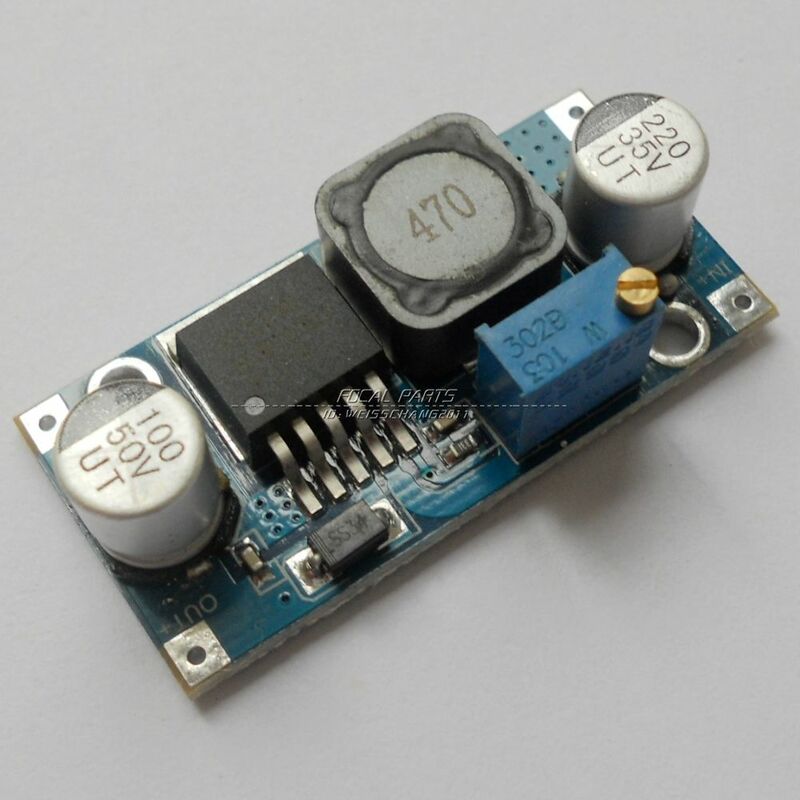 Instead, the lower potential terminal of the LED driver was set at approximately 9 VDC lower than the input voltage, hence the reason why it would not function below 9 VDC input. Rather than try to hack this module, I figured it would be easier to purchase a DC-DC boost converter module off of eBay from a US seller. 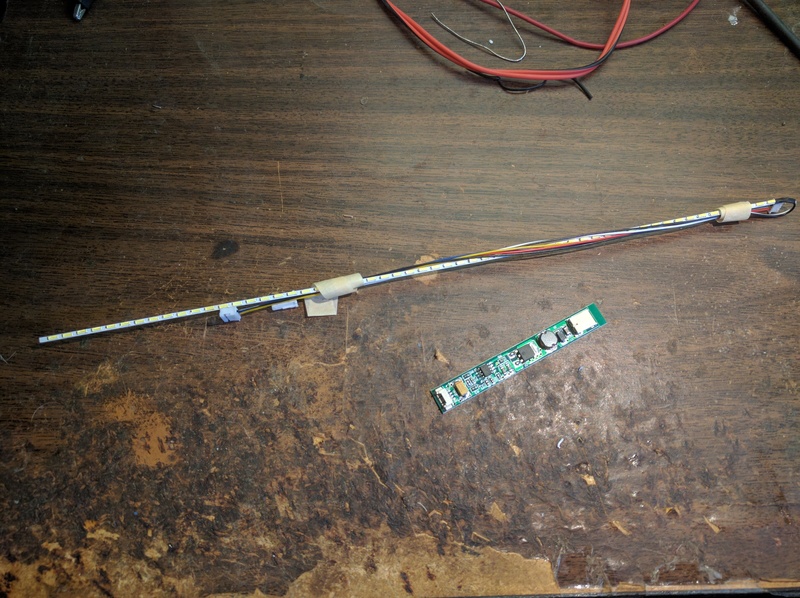 After a few days, I had a XL6009-based module in hand, which looks to have a wide range of usable input and output voltages, and can easily source enough current to drive a small strip of LEDs. 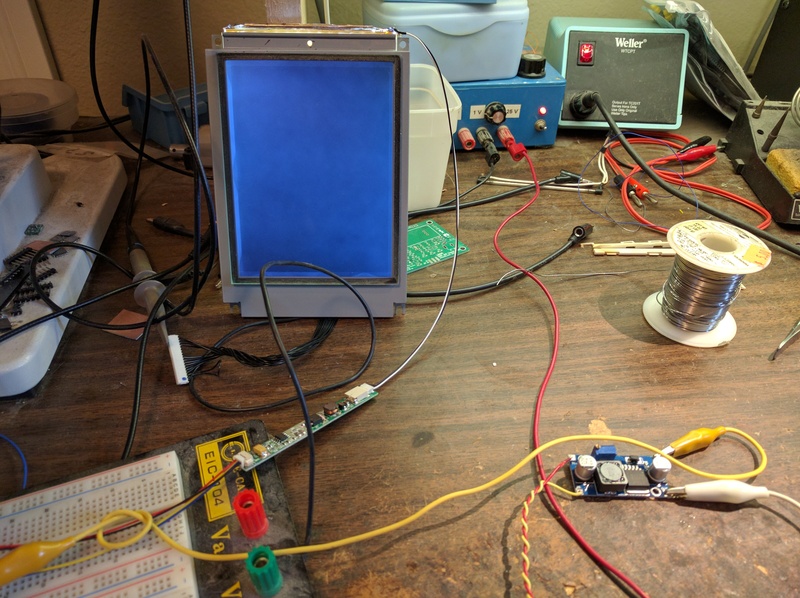 With the plan to drive the boost converter from the 6 VDC rail available from the TDS1012 power supply board, I set my bench supply to supply 6 VDC to the boost converter, set the boost converter to supply 12 VDC to the LED driver, and managed to get everything set up to light that LED strip from 6 VDC input. I just had to hope that the power supply had enough current margin for this LED strip, plus the losses in the boost converter and driver board. Now that the LED has been verified to work correctly, it was time to fit it into the display module in the place where the CCFL used to be. With the CCFL removed, you can peer down into the cavity it has left behind and see the glass panel that diffuses the backlight. 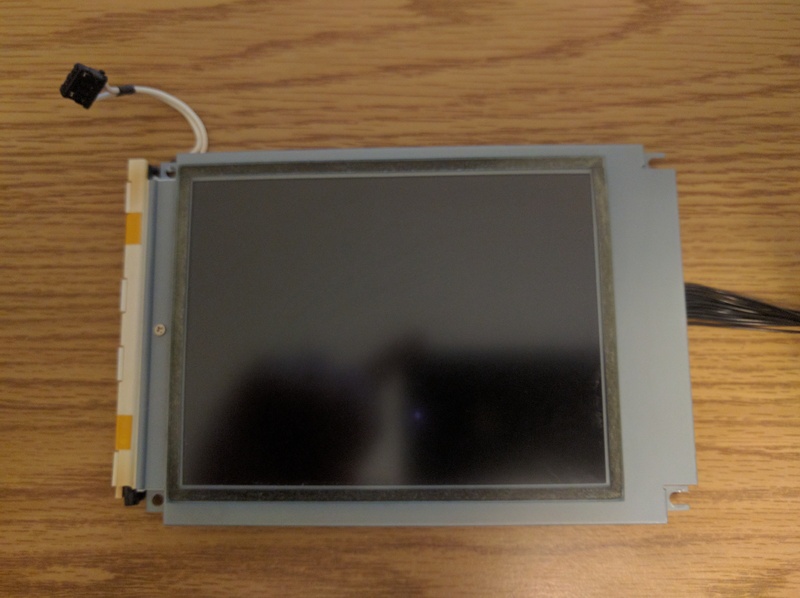 The LED strip was placed facing into the edge of this glass so that the terminals came out of the top of the module (where the old CCFL wiring ran), and I used RTV silicone to secure it in place. I chose RTV silicone for two reasons: it would be easy to remove if I messed up the placement of the LEDs and it would be reasonably transparent if I got some adhesive in between the LEDs and the glass. It appears that was a good choice. Now I used epoxy (the cheap stuff from Harbor Freight) to seal up the plastic cover that I cracked earlier, mainly to provide mechanical stability and extra protection to the LED strip. Once that was dried, I lashed everything up to breadboarded driver circuitry to ensure that the backlight was actually do the job. As you can see above, it looked good so far! The real acid test for me was to see if the TDS1012 could actually drive the new backlight from its own power supply. I really had no idea if the current budget was there in the instrument, as there weren’t enough details in the service manual to know. So I had to just lash it together to try. 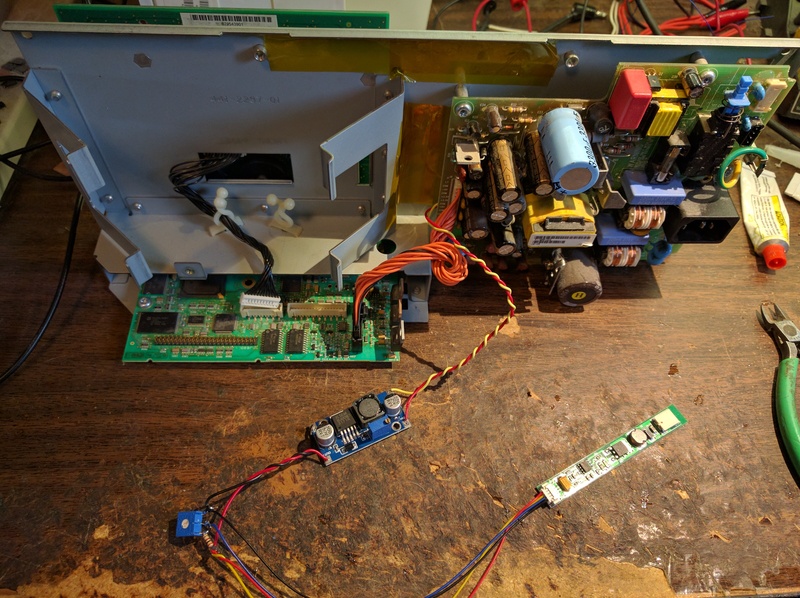 The boost converter was soldered into the 6 VDC and GND terminals on the J9 connector on the power supply board, and then power was applied to check for magic smoke. Nope, success! BTW, if you are replicating this test, be sure to plug all of the modules together, as the instrument won’t power up unless all of the cables are connected. Now the job was to stuff the boost converter, trimmer pot, and LED driver module into the existing chassis so that it was secure and safe. The modules were test fitted into spaces where they looked like they would conveniently fit, and then Kapton tape was generously laid down on the chassis to give them a safe mounting point. Fortunately, both of the modules were small enough to fit quite nicely in existing space, and both were single-sided boards, which meant that they could sit flush against the Kapton tape easily. The modules and pot were secured in place using more of that epoxy (although hot glue would have probably also worked well). The leads to the LED strip were routed back through the hole in chassis where the old CCFL leads went, and easily were able to reach the new LED driver module. After that, it was a simple matter to reassemble the instrument and power it on for a final smoke check. Although not the most skillful of hacks, it’s always quite satisfying to recover something of value from the scrap heap with a handful of parts (about $15 worth in this particular case). I think the new LED backlight is actually brighter than the old CCFL backlight, but it has been a while since I’ve seen it with the original backlight, so that’s a pretty poor subjective observation on my part. 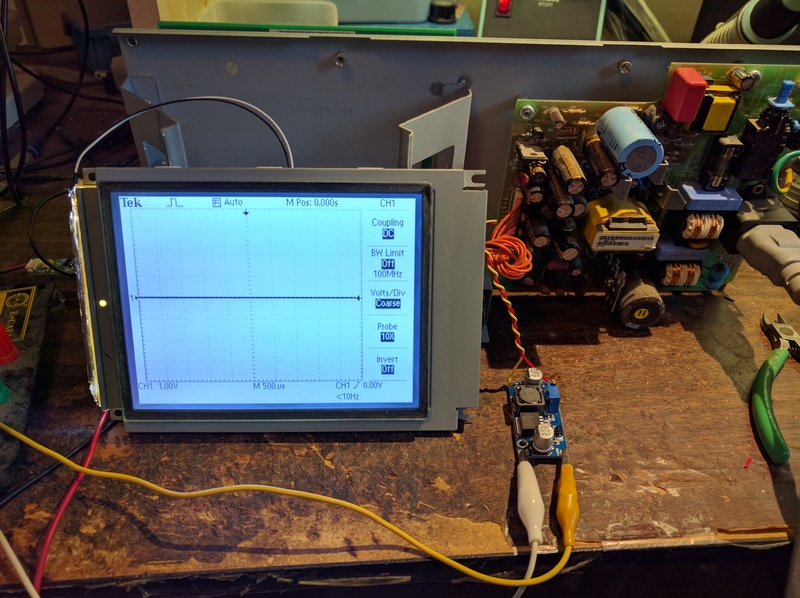 One small warning here: I have only done rudimentary checks to see what effect the DC-DC boost converter would have on the measurements from the scope. I don’t see any obvious hash from the switching power supply on the most sensitive vertical setting, but it’s possible that the this might introduce some low-level unwanted spurious into the instrument, which perhaps may be visible when using the FFT function. Caveat emptor. You have been warned. 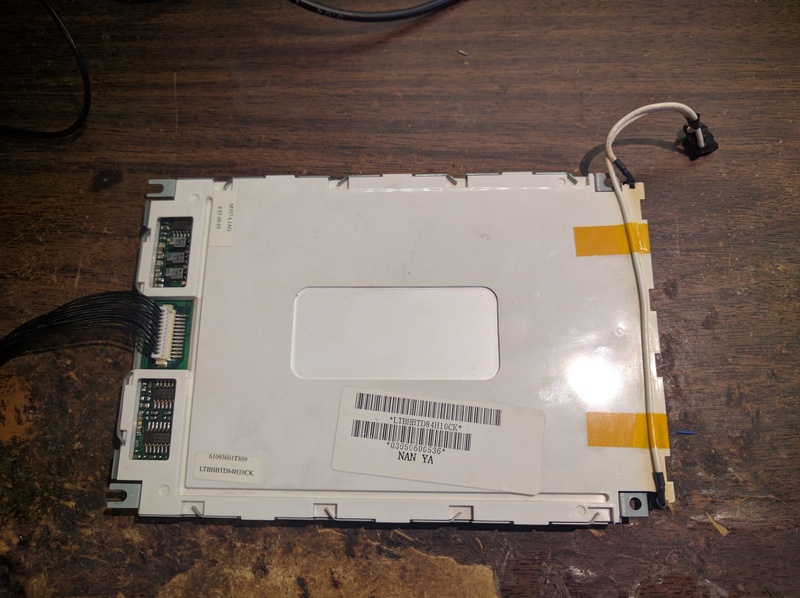 So for those of you with older instruments with busted CCFL backlights, I would highly suggest that you can retrofit a new LED backlight if you have some moderate electronics skills. There’s nothing particularly magical here. 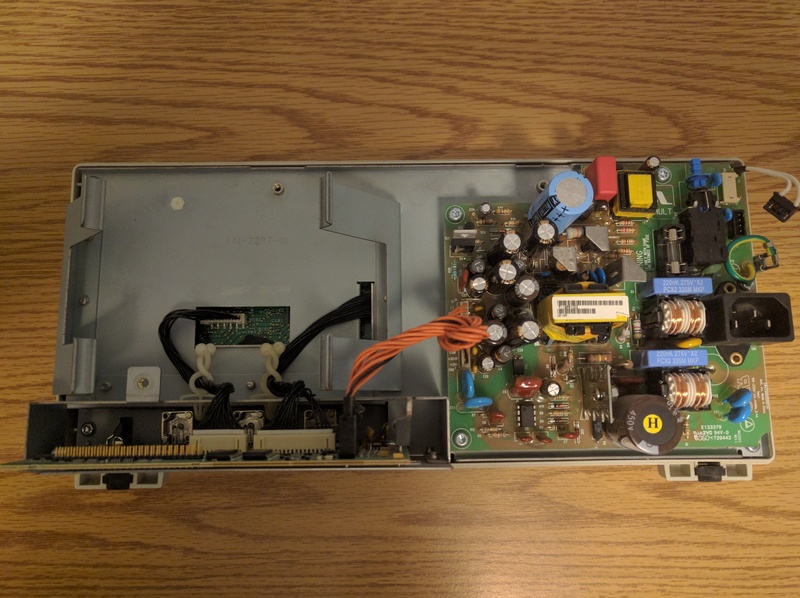 The biggest concern is whether you can pull enough current from the existing DC power supply, but I imagine most instruments have power supplies that are designed to easily give up enough extra current to power a small LED strip without and difficulty. And if you have an instrument with 12 to 24 VDC already available, you can skip the boost converter that I had to use and not even have to worry about that. Give it a try and give some old junk new life! Yes, a belated Happy New Year greetings! It’s hard to believe that 2013 is already well under way. 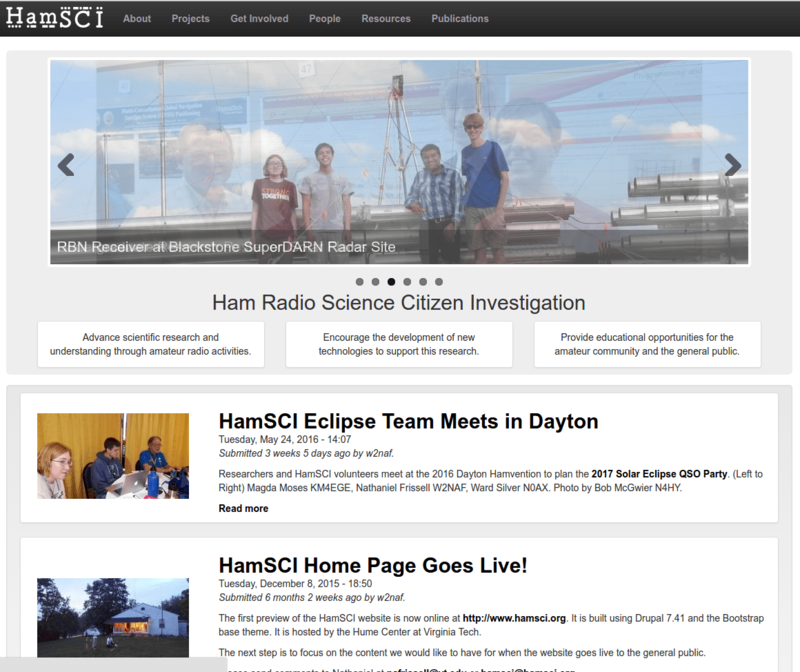 I figured it was about time to give you a quick update on what’s going on in the shack right now. First up is the discrete component grabber receiver for 14.141 MHz that I prototyped to be paired with the OpenBeaconMini project. 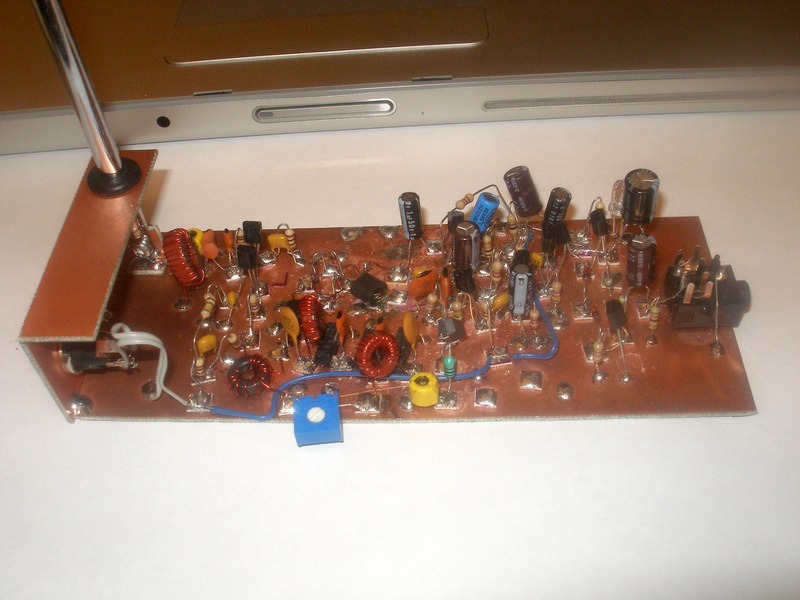 The receiver itself consists of a roughly 2 kHz wide crystal filter on the front end, feeding into a single-balanced diode ring mixer, which drives an AF amp using 2N4401 and 2N4403 transistors. Because I’m not able to put up a proper outdoor antenna for the grabber right now, I decided to put the VE7BPO cascode active antenna on it instead. It seems to work well, but I don’t know for sure because there are basically no signals on this part of the band. I intended to use my Raspberry Pi with the receiver as a grabber, but I had no luck getting either LOPORA or QRSSVD to work properly and reliably. It may just be asking too much of the poor beast. So I’m going to try to appropriate another PC in order to get the grabber receiver QRV so that on-air testing of OpenBeaconMini can begin in earnest. 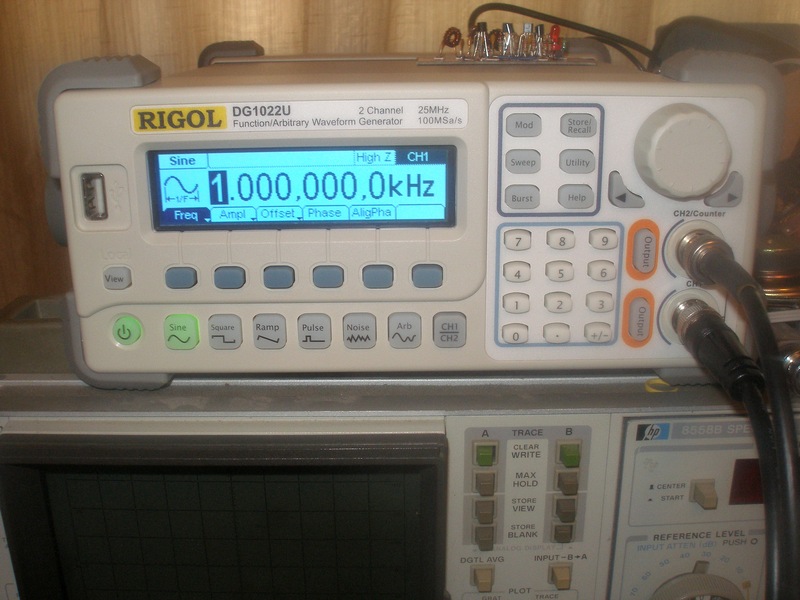 Next, I wanted to give you a very brief overview of my most recent purchase for the lab: a Rigol DS1022U arbitrary waveform generator. As far as I can tell, this appears to be pretty much the same as the DS1022A model that is sold in the US. But being a typical ham, I wanted to save a few dollars, so I purchased it off of eBay from seller who says he is an authorized Rigol dealer. The DG1022[U|A] has two channels that can output a sine wave up to 25 MHz in 1 mHz (as in millihertz) steps. It can also provide square, ramp, pulse, noise, and arbitrary waveforms at lesser frequencies. It can modulate the waveform in a variety of ways, including AM, FM, PM, PWM, and FSK. It can, of course, also do sweeps of various parameters. The output amplitude into 50 Ω ranges from 10 Vpp on Channel 1 or 3 Vpp on Channel 2 down to 2 mVpp on both channels (or -50 dBm). The shielding on this AWG seems to be excellent. Using my HP 355C/355D attenuator combo, I can get a signal down to about -140 dBm (disclaimer: not a scientific measurement, made using my ear as a detector and listening on my IC-718). The dual outputs makes it very useful for a variety of two-tone receiver measurements, one of the big reasons driving my purchase. 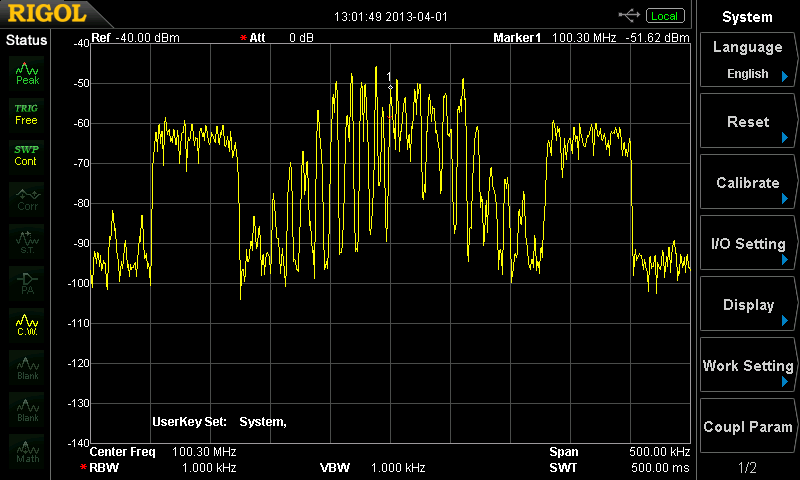 The Channel 2 output also doubles as a 200 MHz frequency counter input. Paired with the USB connectivity of the device (it seems to enumerate as a usbtmc device), that will be extremely handy for measuring oscillator drift. The DG1022 can also link the two channels together and give them a specific phase difference, as you can see below. 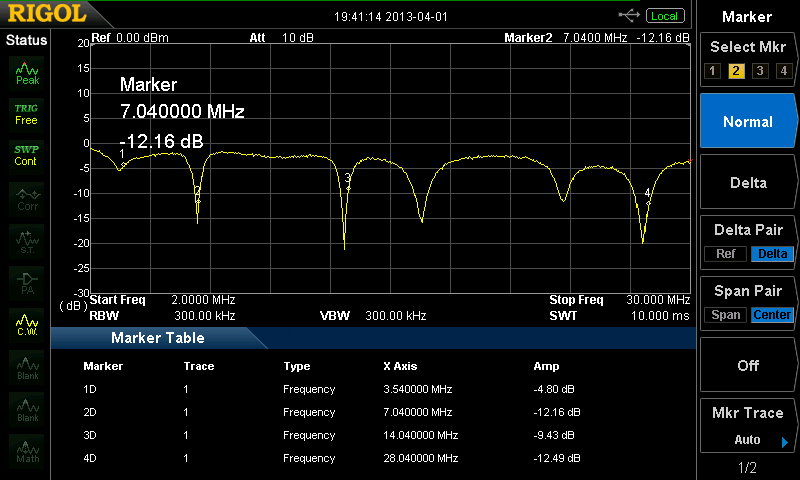 This will make it very handy as a I/Q LO when I want to experiment with phasing and SDR rigs. So far, I’ve been very pleased with my purchase. 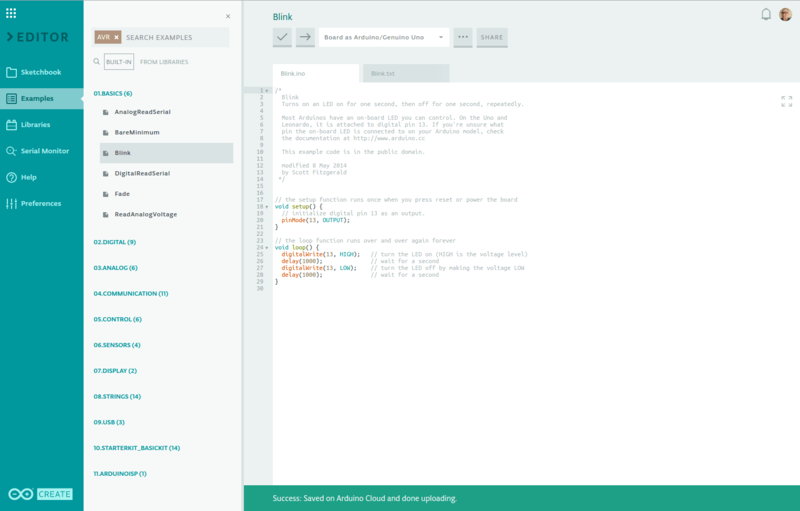 I don’t feel like I’ve had it or used it long enough to give you a full review, but I thought that this preview would at least be a bit helpful for those thinking about using it. One of my goals for the new year is to do a much better job of characterizing everything that I build. 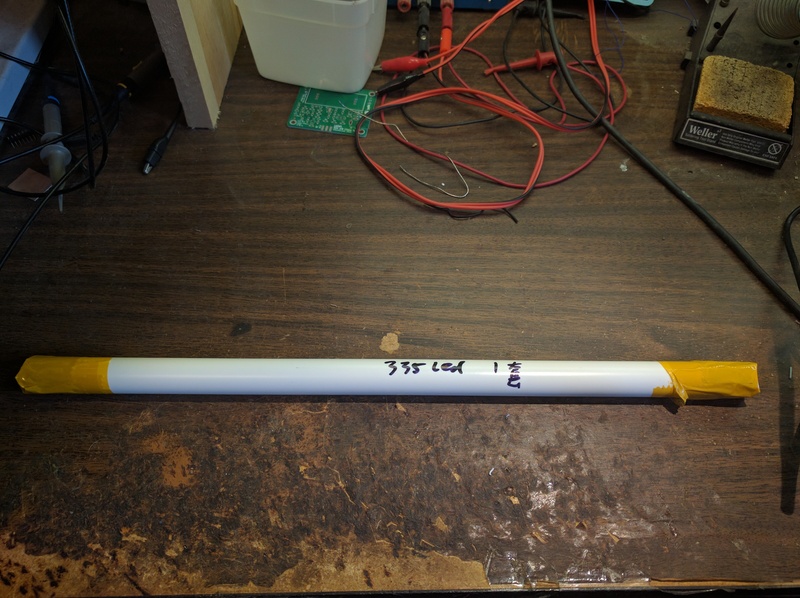 Since I intend to start selling transceivers in the near future, it’s doubly-important that I can make accurate measurements of my products so that I can properly state their specifications. 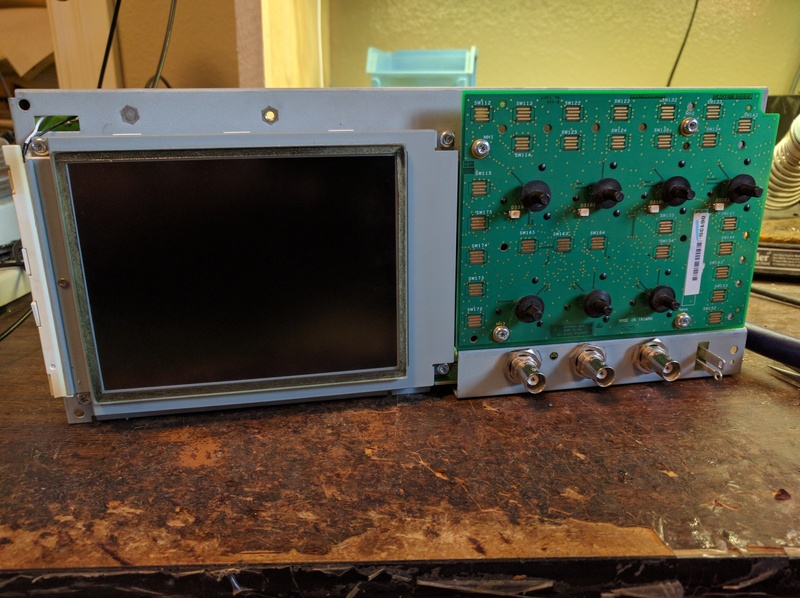 To this end, I’ve decided to sell off a bunch of my unused or replaceable test equipment (please take a look at the for sale posting) in order to finance the new, calibrated test gear. 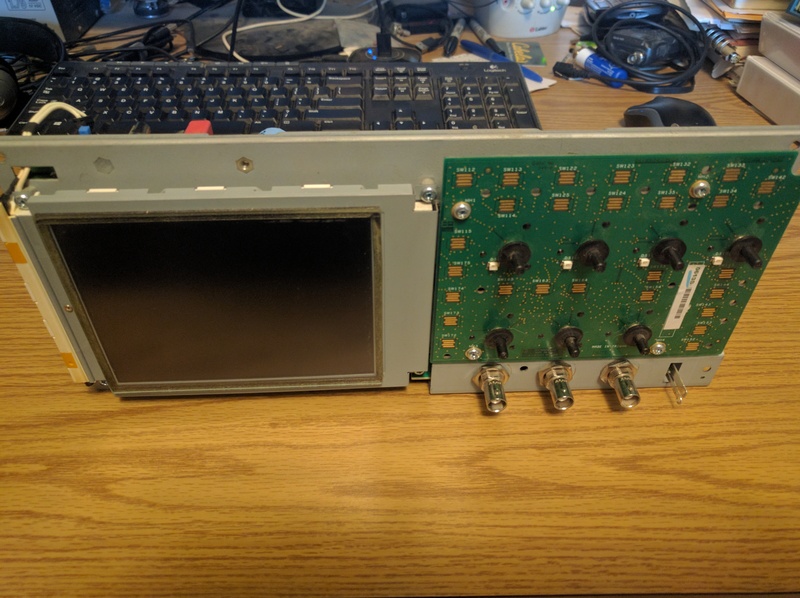 Next up on my purchase list is a Rigol DSA815TG spectrum analyzer (just reviewed favorably in the February 2013 QST), but that’s going to require the sale of everything on that page! Finally, I’ve got the CC1 prototype PCBs on their way from Seeed Studio right now. It looks like they just cleared customs in the US, so hopefully they will be in my hands in the next few days. With any luck, I’ll have the first one built by the weekend and will be well on the way to a new beta test. I’ll put up a quick post to show off the PCBs, and when the first prototype unit is completed. Stay tuned!